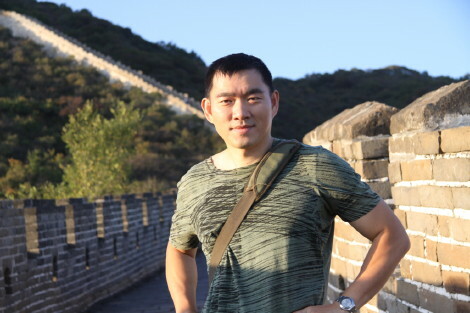 This month we introduce Yan Lu, Vice-President, General Manager, RMG Networks , where he is responsible for the company’s office, staff and operations in Beijing. Describe your personal workspace. The RMG China office is located in Tsinghua Science Park at Beijing, along with many prestigious high tech companies. Sitting in my chair, to my right, there is a glass wall. I can see a huge beautiful lawn, surrounded by highrise buildings. This might be the best viewing spot in this area. How do you get to work? I am so lucky to live only five minutes’ walk away from the office. Beijing is notorious for its bad traffic in rush hours. Some of my team members need to commutes two hours each way to work. Normally, in the morning, they need to wait in queue for 10 minutes just to get into the subway station. Then, there are dedicated subway staff responsible for pushing people into the subway cars. What is an average day like? Our team has a 10:00 a.m. standup sync up meeting every morning. Then I will give myself two hours closed door working hours to reply to all the emails left by our U.S. colleagues during our nights, and make phone calls with California folks while they are still awake. Then, the afternoon is full of individual meetings, interviews, customer visits, etc., followed by one hour in the gym and then with my boy for his English and math homework. What is your favorite activity outside of the work place? Photography. I have my Canon 5DII with a full set of 2.8 lenses in the car and a Leica x2 in the office all the time. It is really fun to have something always ready to help me record my viewpoint of the world.And travel. I like to travel alone. My current vacation plan is to spend two weeks driving around Tibet by myself. What is essential to you being able to work happily? Everyone’s creativity and accountability. These are my top two requirements from every team member. How flexible are your working conditions? Transitioning our China office from an engineering center to a business center, we want to make sure we are NOT as flexible as we used to be. For example, we are beginning to put in a dress code and core business hour rules in the office. What do you think your employer looks for in its staff? This is an easy one: numbers…and if the number is not there yet, the effort to make the number happen. What suggestions do you have for your company? I have seen many great activities happening in this company during the last two months. My suggestion is to keep pushing forward relentlessly. If I come up with any more detailed suggestion, I will definitely submit it to earn the US$1,000 company’s New Idea Award. What is the most frustrating thing about your daily work? I cannot tolerate irresponsibility or mediocrity. We have a small team here and we need everyone to be aggressive to compete with those big companies. What do you like best about your job? This is a 4 billion Yuan industry in China and we have 4 billion market share to achieve! How open is your company to new ideas and suggestions?This company has great passion for new ideas, and there is a program in place for awarding innovative ideas, even tiny improvement ideas, from each employee. How much responsibility have you been given? I have full responsibility for RMG Networks’ China business. I have the empowerment from the company’s executive team. At the same time, I can feel the expectation and pressure. How green are you and your company? Think about this: we have 20 people in the office and only three are driving to work. All the others are taking public transportation. I believe that is very green. Someone from the other side of the world will ask, “Why not biking?”. Well, I do not really recommend our employees to ride a bike on crowded streets, in the middle of smoggy air for an average of 20 kilometers under 35 degree Celsius every morning. What inspires you? Creativity, accountability, and certainly the most important, winning deals. What makes you laugh during the workday? Hearing one of my co-workers sneezing two times around 3 p.m. every day! Seriously, this gentleman has the loudest and the most unbridled sneezing sound I have ever heard. I know the entire office is waiting for that moment every afternoon. When he takes the day off, everyone think there is something missing in the company! What are your ambitions? To take one year off and travel around the world, by myself, going to Tibet, Australia, Scandinavia, Greenland, Alaska ….! If you could change only one thing in your work or workplace, what would it be? I want to renovate our office again and make it the most creative working environment in the industry. How much time do you devote to social networking? Hmm….totally one hour per day, but I am checking my Weibo, Weixin, QQ (Chinese version of Facebook, Twitter) every 10 seconds! What are your most useful tools you use to do your job? My smart phone! Email, video conference, social network, reading books, booking hotels – I can rely on my phone to do everything needed for the job! When can I get a phone helping me drive the car? What would be your dream job? I believe every dream job will last, at most, six months. Every dream, when it becomes a job, is no longer a dream. In fact, I already have my ever-dreamed-of job right now – and my next dream is to become a scuba diving trainer in the Maldives!